Kinesthetic math involves using the entire body to learn math and not just hands to write. It makes learning active. We have heard of people who hate math begin loving the subject after learning it with kinesthetic activities. In kinesics, young learners are introduced to the number system along with its quantity. An object usually called the manipulative/counter is given to the child to count. This allows the child to touch and count the number which helps him associate the number with the quantity. This tactile method of learning ensures that the learner remembers the concept more clearly. The counter can be buttons, beans, toffees, toy cars, etc. The counters are kept to the Right Hand Side of the child. The teacher shows the digit and the child moves as many counters to the Left Hand Side. The child touches each counter and counts the number, forming a number line which is counted from left to right. This is called the push and count method. For instance, if the number to push and count is 7, then there will be seven in the line and 3 left in the group of 10 counters. In this way the child observes that 10 can be derived by adding two numbers—7 and 3; and that 7 is a number that is 3 counters less than 10. A lot of basic math vocabulary such as count, quantity, take away, left over, add, subtract, etc., can be introduced with the counters. We have to ensure that the numbers are touched and counted at the end of the given instruction. Using the above method even a 4 year old can be taught to solve word problems. Children will hardly face the problems associated with using the correct math operand. Usually I have seen students wondering whether to add or subtract in a word problem. In this method, the student solves the problem without the pencil and paper. So the child is listening and observing while the teacher demonstrates and not merely write the numbers. Push and count —for quantity recognition. One more — basic addition with only one digit. One less —- basic subtraction with only one digit. I have observed that this method is a favourite with my students as they understand the concept which increases their confidence and makes math classes more meaningful for young learners. The maths teacher wants the concept of multiples to be a fun learning. So he makes groups in the class. The teacher decides on the multiples of 3. Each group is asked to call out numbers starting from 1 and the person calling out a multiple of three will have to clap. If they don’t clap then the team loses a point and will have to start from the beginning. The groups will compete to see who calls out the maximum numbers without mistakes. Object of the activity – To read and write number names of 6 to 7 digits (up to lakhs). This activity should be attempted after students have been taught the Indian place value system. Teacher arranges numerals using number flash cards and number names from easy to difficult numbers in a pathway. She also specifies the number system. Teacher plays soothing music to facilitate concentration. Students walk in front of each number read them and make a note of them and only then move on to the next number. It is a group activity wherein peer group learning is encouraged. This type of activity induces competitive spirit. 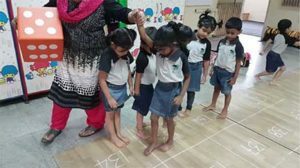 If this article has led you to believe that kinesics is meant only for the primary classes here is an activity to show you how kinesics can be used with older students as well. Paper tile activity to learn multiplication of binomial expressions for grade 8. Cut cardboard sheets into 3 different measured tiles (2 squares and one rectangle shaped paper). Students were asked to arrange question in the form of paper tiles horizontally and vertically and they need to fill it using 3 different set of shapes of the paper tiles. It is easy to analyze the multiplication of polynomials by arranging paper tiles where they can easily count the number of squares and find out the answers. The author is secretary and creator studio school, kinaesthetic mathemagician, Achieve School of Education with the math department.